The chef and Hawaii native on his favorite things to eat on the island. Troy Guard is the chef and owner of a number of restaurants in Denver, including TAG, where his menu is influenced by his Hawaiian upbringing and travels in Asia and Latin America while celebrating the best local ingredients. Last month, I was lucky enough to be in Maui not once, but twice! As a native of Hawaii, I try to get back with my family once a year—but since the birth of my 2½-year-old son, we haven't braved the flight. This trip was a long time coming! Our first trip was with the kids on their spring break; the second time around was with my wife, Nikki—a true vacation! Hawaii has an amazing climate, fresh produce, and lots of amazing local fish. The Island Gourmet Market, in The Shops at Wailea, has all of the basics to stock your condo or to grab snacks for the beach. You can even sit down for something hot off the grill. My go-to here is the cannot-live-without Spam musubi. It's the ultimate portable snack (it consists of grilled Spam on top of rice and wrapped in nori), and it’s suitable for any time of day. I'm also a fan of the kimchi fried rice. Honu is a great seafood and pizza spot in Lāhainā that’s named after the beloved Hawaiian green sea turtle. Pizza in Hawaii might seem silly, but they do a nice job with their pies—we enjoyed one with lobster (no ham and pineapple here!). They also do an amazing job with tuna—it’s always so fresh and deep in color. We could eat the Ahi bruschetta every day. We also had an Ahi Bolognese with seared Ahi and Ahi sausage—two words I’d never think to put together, but it was awesome! Not only is the food great at Honu, but it's just steps from the beach with incredible views of the Pacific. 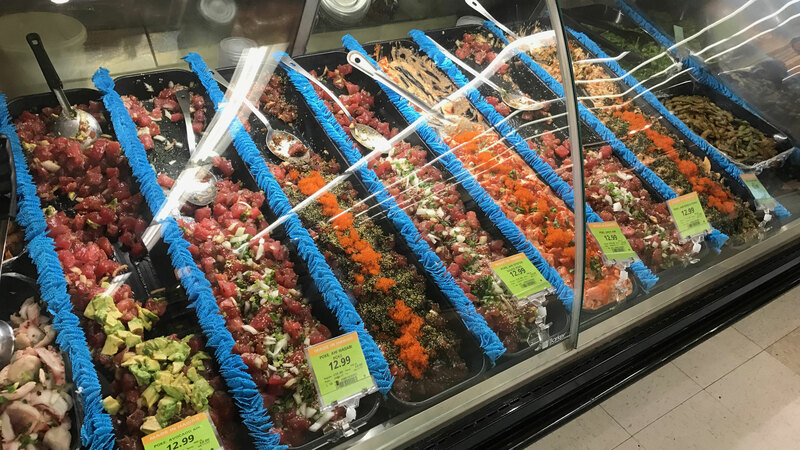 As a guy who grew up in Hawaii, I'd be remiss if I didn't talk about Poke and “plate lunch.” Hawaiians love their poke and you can find a vast selection just about anywhere—a local grocery counter typically has 8-10 variations including tuna, salmon and more exotic options like octopus and mussels. Plate lunch is a carb-heavy concept that my wife wants to, but cannot, understand. It features deliciously salty Kalbi short ribs (or any of many other meats—my other favorite is Kalua pork), and it comes with a scoop of steamed white rice and a scoop of creamy macaronu salad. Best spots for this fare on our trip included Joey's Kitchen and Da Kitchen. After you take down all of those carbs, it's smart to take advantage of Maui's outdoor activities. We started with a snorkel at Kapalua Bay and saw lots of fish on the reefs, as well as several turtles. Then, we decided to trek by foot back to the Ritz and wound up on a nature trail that took us over the bluffs (where I remembered cliff jumping as a young buck). We found our way to a spot near the Cliff House. There are some great jumps from the rocks, or you can (ahem, this might be illegal) swim across the cove to the actual Cliff House, climb up about 25-30 feet and jump off. Not saying I did this, but not saying I didn't! Beautiful tide pools, too, but word to the wise: never turn your back on the ocean!